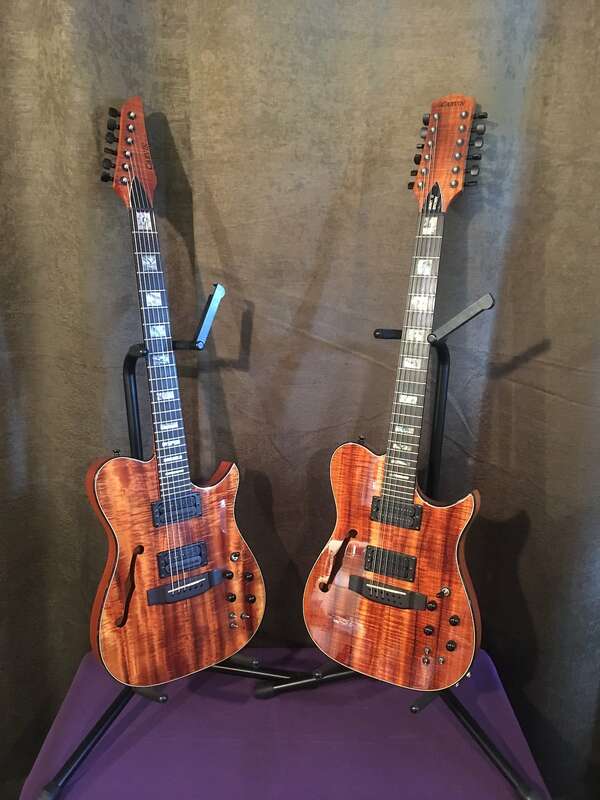 Re: Vintage & Unusual Carvin-Kiesels? Can be bought separately. I wouldn't mind that twelve. a pair of Aces no doubt. Would love to grab this one. Just not high enough on the current 'want' list. Unfortunate.........for me. Mid 80's I believe. Handed down from an uncle to my dad to me. Interesting detail is my uncle had his name on the headstock. Jack on one and Bauer on the other. Done in what looks to be pearl inlay. Not sure if Carvin did that or if he had it done later. I still play it although not on gigs as it is extremely heavy! southdakota wrote: it is extremely heavy! Solid hard rock curly maple doubleneck? I would absolutely believe that to be the truth, even though the bodies on these DN's are kind of shaved in on the sides in terms of width versus say a Gibby. Probably gotta be at least 15-16 lbs I'd imagine? Somewhere in a thread years ago I did weigh it and I believe it was around the 15Lb mark. I'm really curious to know how the name on the headstock got there. I've never seen an old Carvin with that so I'm guessing he had someone else do it after he got it. I'd also like to see a wiring diagram. There are so many switches and while I can hear a difference, I really don't know exactly what each does. I have to assume each guitar has 2 coil split switches, and a polarity/phase switch, and the 'top' guitar also has a 'which guitar' switch. spudmunkey wrote: I have to assume each guitar has 2 coil split switches, and a polarity/phase switch, and the 'top' guitar also has a 'which guitar' switch. Yeah you can see the guitar selector sitting just to the left of the TOM of the bottom geet. And to OP, yes, spud is right... from front to back I would imagine the mini switches are coil splitters for each pickup to turn each in and out of bucker/single-coil, and the rearmost switch will throw both pickups out of phase with each other when the pickup selector is in the middle. You won't hear any difference if you move the phase/polarity switch around if you have the pup selector out of the middle position, because one pickup alone has nothing to reverse it's polarity versus. So only when both pups are engaged will the last mini switch have an effect (and this is regardless of the single/humbucker permutation, they will still go out of phase versus one another even if H/H, or S/H, or H/S, or S/S). Well, dang... I want a Jack Bauer signature guitar! ElfDude wrote: Well, dang... I want a Jack Bauer signature guitar! Thanks for the info guys. Yeah, that sounds about right. I'm so used to coil tapping on push pull knobs that I didn't consider that as a possibility. As for the signature model...I know Jack is smiling down from above reading that. Crazy thing about my uncle Jack and this guitar is that he used to play it live a lot...standing up. And he was about 5'6" and maybe 150 lbs soaking wet. I'm sure it was a relief when he strapped on his tele!